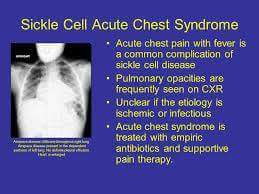 •ACS is the leading cause of morbidity and mortality in children and adults with Sickle Cell Disease. •Treatment ◦Bronchodilators Trial of beta-agonists for clinical response is advocated even in those without wheezing. They may cause a rebound of Vaso-occlusive Crisis and need to be tapered. ◦Pain Control Need to optimize pulmonary toilet by providing adequate pain management, but avoid over-sedation leading to hypoventilation. NSAIDs have proven to be useful in conjunction opiods.